Due to the recent cold weather in Michigan, it may not have seemed like summer would ever arrive. But, a campfire is the perfect way to end a chilly May day. 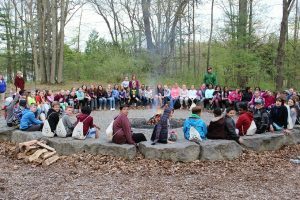 Powers Middle School’s 6th graders had the chance to top off one of their days at Tamarack Adventure and Retreat Center with a campfire sing-along. Eighty-one students fit perfectly around Jeff Grey’s Circle Fire Pit. A beautiful circle made of logs and stones built for groups to enjoy nights, such as this, together. Led by eight staff members, students sang and danced along to campfire classics and some new hits. Baby Shark…Mama shark…Daddy shark…Grandma shark…Teenage shark…Went For a swim…Saw a shark…Swam real fast…Shark attack…Lost a leg…Lost an arm…Swam in circles…There came a lifeguard…CPR…Fell in love. The “swam in circles” seemed to be the students’ favorite verse. As the staff jumped in circles on one leg and one arm behind their back, laughter filled the air. The chaperone favorite was “there came a lifeguard” due to the slow-motion running dance move done paired with it, giving credit to Baywatch. While the song could be interpreted as slightly morbid, it’s a classic and elicited more smiles and laughter than anything else. Next, two boys wanted to lead their favorite campfire song. As a “repeat after me song,” the students followed along. Their song centered around a moose and also included dance moves. A group of girls also stepped forward to sing a Jamaican campfire song that all the students seemed to enjoy. It was amazing to see, typical quiet students, come out of their shells and lead their fellow classmates. 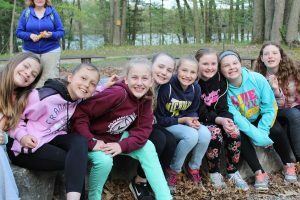 Maybe it was the darkness, the group environment, or just the comfort level they had built up over the past couple of days—regardless of the reason, it was fun to watch them build confidence as they led their fellow classmates in song around the orange and yellow dancing flames of the campfire. Some other songs performed included Boom Chicka Boom, The Taco Bell Song, The Penguin Song, and Bo Diddley Bop (Pizza Man). 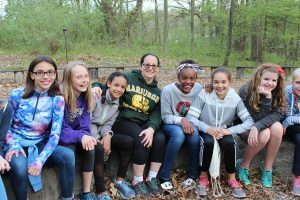 As the night came to a close, the campfire ended with a Tamarack Adventure tradition. Making “rain” with noises that include students rubbing their hands together, snapping, and hitting their thighs. You could see the calm take effect as everybody began to focus on the “rain”—together. Students only hear the “rain” if they listen to the cohesive sound, instead of individuals. By working together they are able to create something truly special. And what a great lesson for life, so easily taught one night around a beautiful campfire.